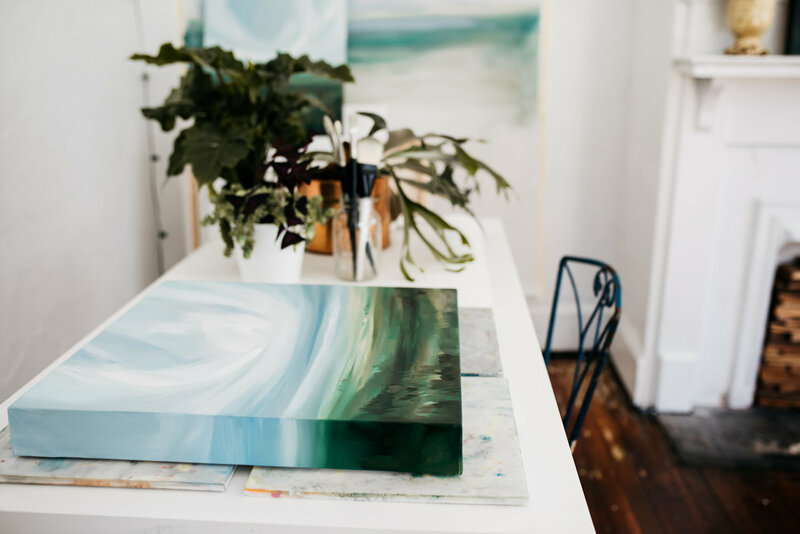 As an artist, Emily Jeffords produces her signature stunning landscapes, which evoke a powerful sense of calm and serenity. As a wife and mother, Jeffords is thoughtful, compassionate, and dedicated to nurturing her family’s needs and wants. In person, Jeffords is lively, light-hearted, and quick to magnanimously point out the achievements of others. In her writing, however, you begin to see the fullest picture of Jeffords emerge. She is a sage and powerful advocate for the exploration of creativity, for not only her fellow artists, but for her large, ever expanding community of followers and fans. Jeffords grew up in an unconventional family and went on to strike out on the unpredictable and, at times, thankless, road of a full time artist. 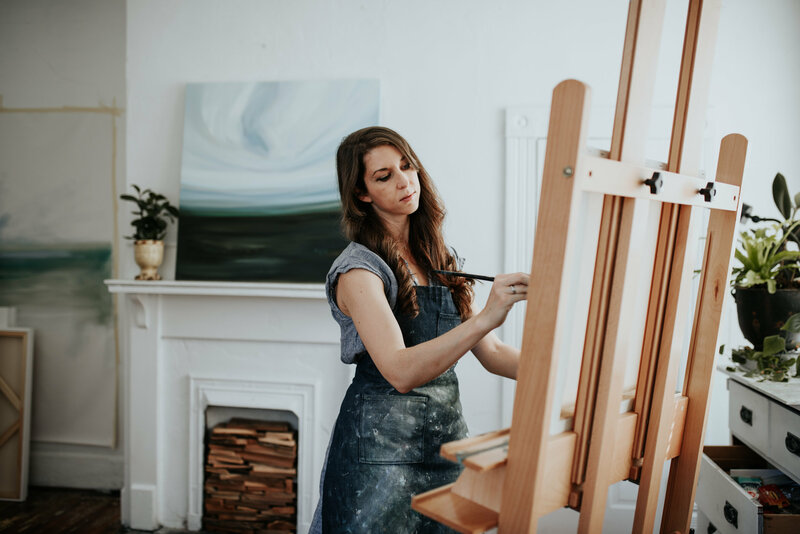 Driven by seemingly limitless creativity, Jeffords is curious and passionate about exploring new ideas, cultivating new spaces for artistic expression, and defining her own path to creative and personal fulfillment. Q: First, take us all the way back to the moment you knew you were going to be an artist. Was it an instant realization, or did it take a while for the idea to grow? A: I studied music pretty seriously as a child and teen and almost went to college for violin performance, but at the last moment, I decided I would rather be an artist. I had taken painting and drawing classes in high school and felt so much happiness and success there. The rest unfolded day-by-day and idea by idea. Q: You had an eclectic childhood full of travel, family, culture, and creativity. What was it like to be a part of your family? A: My parents places a very healthy view on success; not defining it not as a dollar amount or career but as a wholly fulfilled way of life. We travelled consistently, learned about life by being in it; out in nature and exploring over cultures. These are mindsets I hope to pass along to my daughters as well. Q: It seems apparent that the way you grew up was formative to who you are - but do you think you would have been an artist regardless? A: That's interesting... I probably would be doing something creative, but I may not be a professional painter. I think the path that brought me here was so nurturing and natural that it's hard to imagine it any other way. Q: You initially planned to be a musician, but felt more fulfilled by art, in the end. Do you think one feeds the other? A: I certainly think all the creative outlets are connected. Self expression starts at the root (that idea or feeling inside of the artist) but it can take shape in so many different forms. I think finding that common connection between visual arts, music, dance... is so fascinating and it takes away the limits we often put around creativity. Q: Fast forward to 2008 when you became a full time artist. What did that feel like to make that leap? A: I had just graduated from art school, having just had my first show (which went super well and nearly sold out) but I certainly had a year of learning ahead of me. It is hard to go from the structure of school and assignments right into your own self-directed work. I remember giving myself deadlines and projects just so I would feel more secure in my creative process. Q: What did the path that took you from a struggling artist to a high-profile, award-winning artist look like? A: I have been selling my work to make a living for 9 years and there have been massive changes to both my work and to the way people connect with it in that time. 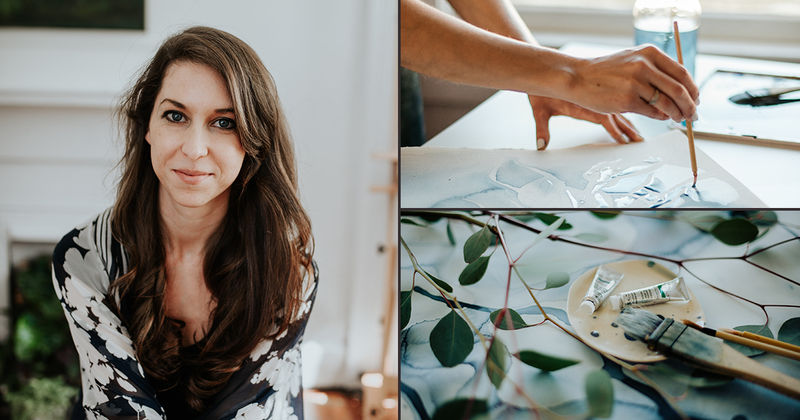 When I started, all my sales happened in person, then spread to Etsy, Facebook, and then to my blog, and now a website and all the social media craziness. The “path” has trends: a lot of hard work, optimism, rarely telling myself “no”, being ok with slow times, not letting successes stop me from pursuing whatever beautiful thing is next, leaning into that subtle, constant ache for something better. Q: Was there ever a moment you doubted you were going to be able to make it as an artist? A: I have been blessed with a wonderfully supportive husband who, when I wasn't producing much income, provided for our needs and allowed me to continue working on my art, and alternately, now that my business has taken off, supports me emotionally and physically so graciously and consistently. He can often be found at the studio, packaging orders or replying to emails even though he has his own career and responsibilities. Another aspect to that question is a bit more psychological: will my creativity run out? That's something that I think about and try to nourish literally every day. We travel to inspiring places, I seek inspiration in pretty much everything around me, and rest frequently. Q: You live in Greenville with your husband and two daughters. How has living in Greenville helped or hindered your career as an artist? A: Greenville is a medium sized city with a really good economy and beautiful landscapes. The art scene here is vibrant and exciting and the people are so passionate and supportive. While most of my collectors are based around the world, my circle of friends and peers in this community is so valuable. Q: You’ve established a thriving digital footprint and community - do you think having such a fluent method of communication with like-minded artists and fans allows you to be a different kind of artist than the stereotype of a solitary painter locked away in a studio? A: Oh, definitely (although I often think social media allows me to lock my self away in my studio more than artists before me because I can talk to the whole world from the quiet of my sacred space.) Social media has allowed me to connect with more people, from far corners of the world, than I ever thought possible. 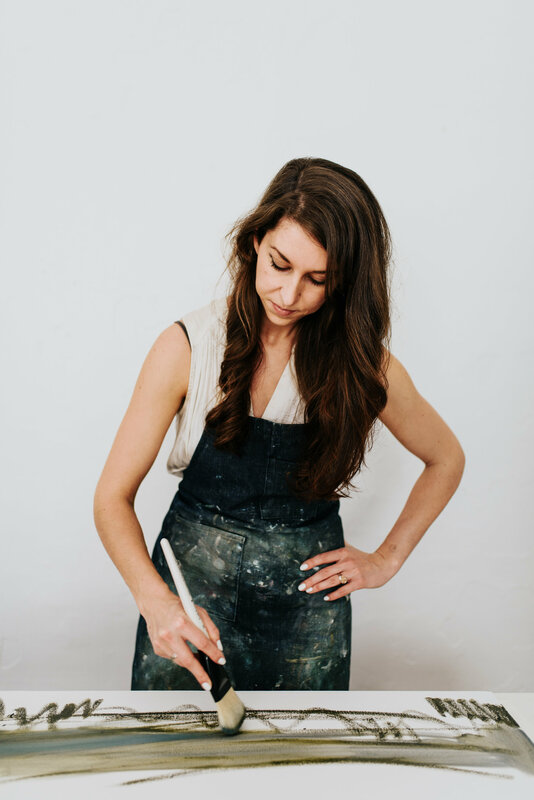 We just spent a month in Europe and I was amazed with how many people came up to me and shyly asked if I was Emily Jeffords - because they follow me on Instagram or have bought some of my artwork in the past. I love when the digital world becomes personal in that way. Q: You are incredibly social media savvy. Do you think it’s important for artists to use social channels to reach their audience now? A: It really depends on the artist and the way that they communicate best. Some are naturals at that medium, others work best by communicating only with a gallery or with people on-on-one. I think getting to know your personal communication style and really leaning into that is key. But social media is such a good tool, I would be hesitant to advise anyone to not at least put a bit of effort into it. Q: You’ve taught online workshops about how artists can best use Instagram, which some would consider giving away trade secrets. Where does the impulse to help others follow in your footsteps come from? A: The best thing about the online world right now is that it is so, so big and there is space within it for you to create your own space that is uniquely and powerfully yours. 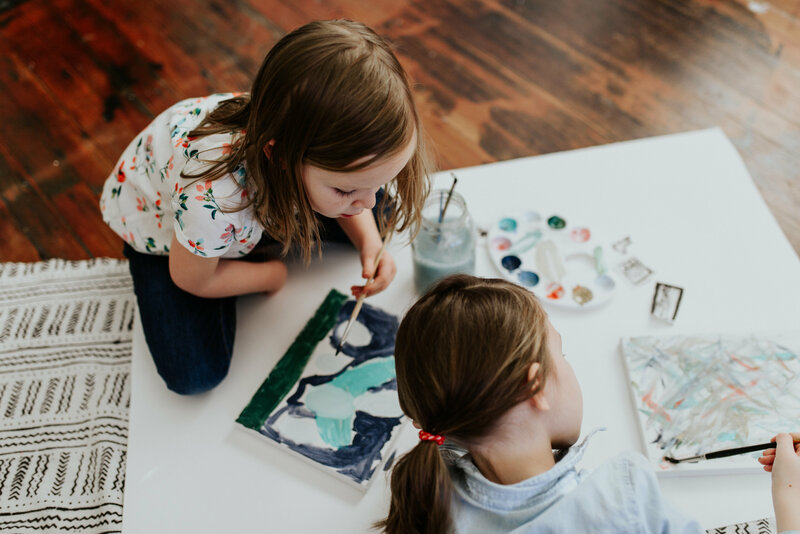 While I give advice about what to post and when, how to reach the right people and communicate effectively, my main goal is for each of my students to create their own corners and to do so beautifully and boldly. 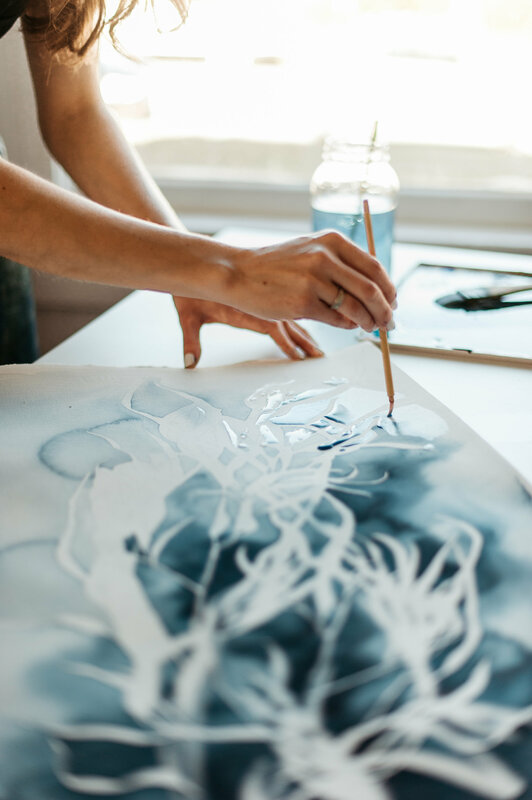 Q: From partnerships with Minted to planning retreats in the French countryside to a mid-century modern home renovation, art isn’t all you’ve got up your sleeve. How do you balance competing priorities? A: Variety is the spice of life! Balancing several different ideas and projects at once allows me to put the best part of myself into each of them. I've noticed when I only have 1-2 things on my plate, I tend to oversaturate them and they lose that “effortless” vibe that I love. “Oh, that just happened.....” Ha! That's never the case, but it does feel more spontaneously wonderful if I have not given myself the ability to obsess on JUST that one thing. Q:Take us through an average day in your studio - how do you work best? A: A typical day for me begins a bit later than most (we get up around 8:30) and my studio hours begin around 11 and end at 3. Several evenings/nights a week I also create from home. I really love getting to define my own workflow and schedule. I am able to blend family and creativity really fluidly and take home as much or as little work as I want. Q: You’re best known for your work with oils, but you dabble in watercolors, mixed media and more. What drives you to try new things? A: Awakening new areas of my mind is something that excites me. Trying to do new things as well and as elegantly as I am able is so fulfilling and adds an element of uncertainty which I find really valuable. Part of art is trying new things to see how you express yourself in that way. That is why Picasso created a whole collection of ceramic sculptures and why Van Gogh only used two colors for some of his paintings. Trying new things adds a new dimension to your mind and gives your creativity a fresh space to work within. Q: Is a glass of wine ever part of your artistic process, or does the wine wait for the end of the day after the brushes are cleaned and the canvas is drying? In either case, which Coppola wine would you say pairs best with your sweeping landscapes and delicate brush strokes? A: One of my favorite things is to have a glass of cold sparkling white during a warm summer afternoon in the studio. The kids are in one area of the room painting or drawing, I have hours of sunlight left, and we just paint and paint. It's beautiful.